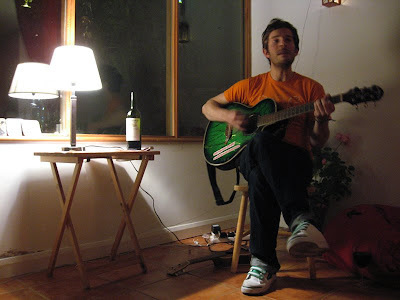 Hello loyal readers, I have a treat for you today, as Terrible Love Songs was fortunate enough to persuade the very talented singer/songwriter Rod Thomas to bare all (artistically speaking) and play a Living Room Concert to a group of friends in Hampstead, North London last Saturday. If you are a regular reader of this website you’ll know that this isn’t the first time we have convinced an artist to play an LRC. We’ve also opened our doors to The Makepeace Brothers and Jacob Golden and both of those evenings were very special experiences; so much so we just keep doing it again and again! 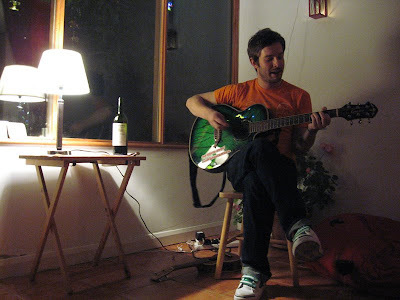 Rod Thomas describes his music as “folk disco to make people dance, smile, laugh and occasionally think a little bit.” I’d describe his music as good pop songs with a twist of folk and a slice of indie dance – all in all a perfect candidate for a Terrible love Songs Living Room Concert. So, the evening arrived, the doorbell went, and there was Rod; a huge grin on his face, chocolates in hand (his mother brought him up well) and a guitar strapped across his back. Introductions followed and, being the nice bloke that he is, Rod agreed to an interview. Looking slightly nervous (and who wouldn’t be! ), he kicked off the performance with a song called ‘Same Old Lines’, which the audience lapped up. I should also add by this point, most of the audience members were wearing all sorts of weird and wonderful wigs they’d found in a dressing up box in the house so I’m pretty sure we all must have looked a bit strange to him. During the evening Rod alternated between the acoustic guitar and the ukulele as opposed to his stage shows where he regularly uses a loop pedal along with a couple of guys who supported him on his recent tour. It was apparent from the very first song that Rod’s voice sounds even better live than it does on any recording I've heard. 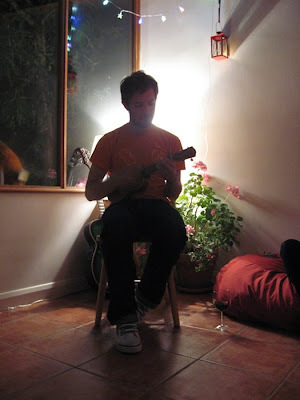 Rod’s performance of ‘Your Love Is A Tease’ was particularly memorable, his voice demonstrating real tonal depth accompanied by only the light strumming of his ukulele. During many of his songs that evening he was pretty much a cappella and, my God, does his voice sound powerful! As I heard someone mention to him after the performance: “You hit notes that were so clear they sounded like a bell resonating”. As one would expect from an artist who continues to busk on the underground despite his recent success, the overall execution and delivery of his set was both hard working and laid back. By the end of Rod’s performance, we were all crying out “more, more, more!” to which he responded with one final song. He realised the crowd was a bit inebriated, so encouraged some audience participation and had everybody join in, clapping their hands along with the tune. To my amazement, somehow we all managed to keep time! Finally the living room concert came to a close and to spare the neighbours the party was relocated to a club in the East End. I had to get to work the next morning so said my goodbyes and as Rod sat in the back of my Italian friend’s car, I waved him off into the Saturday night and prayed he’d make it to his destination. Rod, in your song “Same Old Lines” you begin with the line “Well I’m know I’m not amazing”, I would like to say that we totally didn’t agree with that and can’t wait to see you play again! Sorry I don’t have my usual video footage of the LRC – we experienced some technical difficulties on the evening. I’ll strive to track down some material and get it up in the next week. Sounds like it was a great Welsh night!